Domain-specific languages (DSLs) are heavily used in model-driven and end-user development approaches. Compared to general-purpose languages, DSLs present numerous benefits like powerful domain-specific primitives, an intuitive syntax for domain experts, and the possibility of advanced code generation for narrow domains. While a graphical syntax is sometimes desired for a DSL, constructing graphical modelling environments is a costly and highly technical task. This relegates domain experts to a rather passive role in their development and hinders a wider adoption of graphical DSLs. Our aim is achieving a simpler DSL construction process where domain experts can contribute actively. For this purpose, we propose an example-based technique for the automatic generation of modelling environments for graphical DSLs. This way, starting from examples of the DSL likely provided by domain experts using drawing tools like yED, our system synthesizes a graphical modelling environment that mimics the syntax of the provided examples. This includes a meta-model for the abstract syntax of the DSL and a graphical concrete syntax supporting spatial relationships like containment and adjacency. Our system, called metaBUP, is implemented as an Eclipse plug-in. 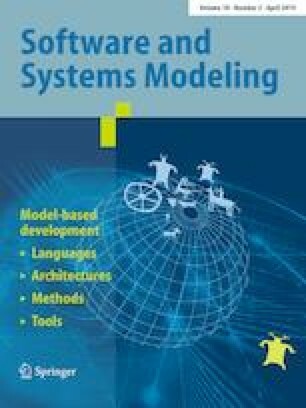 In this paper, we demonstrate its usage on a running example in the home networking domain and evaluate its suitability for the construction of graphical modelling environments by means of a user study. Communicated by Prof. Andrzej Wasowski and Pieter van Gorp. Work funded by the Spanish Ministry of Economy and Competitivity (TIN2014-52129-R), and the R&D programme of the Madrid Region (S2013/ICE-3006). This appendix contains the following documents provided to the participants in our evaluation: formulation of the expected DSL requirements, instructions of the experiment, and questionnaires. Questionnaire 1 was answered by all the participants, in order to convey their opinions on the first version of the generated modelling tool. Questionnaire 2 was only answered by the participants that opted for generating a second version of the modelling tool. Mandatory questions are marked with an asterisk. Table 5 shows the changes made by the modelling expert on the fragments provided by the participants in our evaluation (cf. Sect. 7). The columns contain the participant identifiers, the number of fragments, the editing actions, and the time employed to commit them in seconds.